We detail a protocol to monitor the behavior of neutrophils and monocytes in mesenteric veins under steady state and inflammatory conditions using intravital confocal microscopy on anaesthetized mice. Emre, Y., Jemelin, S., Imhof, B. A. Imaging Neutrophils and Monocytes in Mesenteric Veins by Intravital Microscopy on Anaesthetized Mice in Real Time. J. Vis. Exp. (105), e53314, doi:10.3791/53314 (2015). Efficient immune response is dependent on rapid mobilization of blood leukocytes to the site of infection or injury. Investigating leukocyte migration in vivo is crucial for understanding the molecular basis of leukocyte transendothelial migration and interaction with vascular endothelium. One powerful approach involves intravital microscopy on transgenic mice expressing fluorescent proteins in cells of interest. Here we present a protocol for imaging monocytes and neutrophils in the CX3CR1gfp/wt mouse i.v. injected with orange dye-labeled neutrophils with an inverted confocal microscope. Time-lapse movies gathered from 30 min to several hours of imaging allow the analysis of leukocyte behavior in mesenteric veins under both steady state and inflammatory conditions. We also describe the steps to locally induce blood vessel inflammation with TLR2/TLR1 agonist Pam3SK4 and monitor the subsequent recruitment of neutrophils and monocytes. The presented technique can also be used to monitor other populations of leukocytes and investigate molecules implicated in leukocyte recruitment or trafficking using other stimuli or transgenic mice. Neutrophils and monocytes are cells of the innate immune system that continuously circulate in the blood. Upon injury or infection, inflammatory signals induce leucocyte diapedesis into damaged and infected tissues, herein initiating a cellular immune response 1-3. The rapidity of leukocyte mobilization determines the positive outcome of the immune responses. These intricate processes rely on specific molecules (e.g., selectins, endothelium-bound chemokines) present on the inflamed endothelium that help for the establishment of adhesive contacts between circulating leukocytes and the endothelium 1-3.To get insights on the molecules implicated in the leukocyte recruitment cascade, it is important to visualize the kinetics of cell recruitment and to track the behavior of each cell/population. An effective method involves intravital microscopy on transgenic mice expressing fluorescent proteins in cells of interest. To date, several approaches using intravital microscopy were developed to image the vasculature 4,5. For instance, imaging of ear dermis vasculature or mesenteric veins by intravital confocal microscopy was used to identify the patrolling behavior of murine Ly6Clow monocytes and human CD14dimCD16+ monocytes on the luminal side of blood vessels under steady state conditions 6-8. The mouse cremaster vasculature model is often used to monitor the behavior of neutrophils or inflammatory Ly6Chigh monocytes under inflammatory or ischemic conditions in transgenic mice. In that case, cremaster is stimulated via intrascrotal injection of IL1β, CCL2, TNFβ or fMLP. After 2-4 hr, tissues are then surgically exteriorized and analyzed by intravital confocal microscopy 9-11. 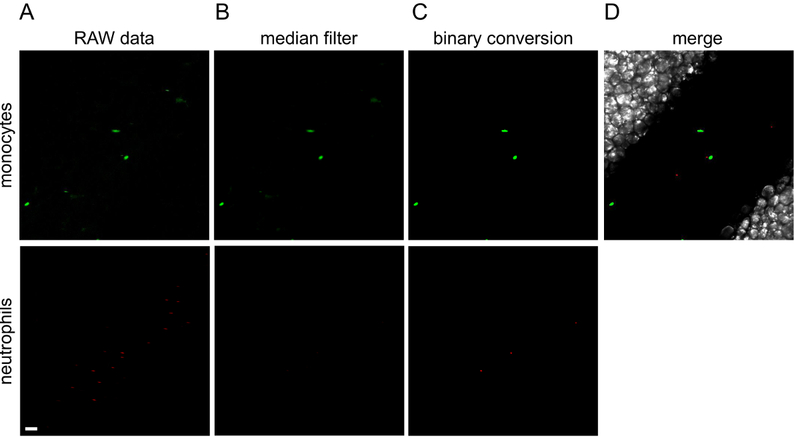 The following protocol describes a method to monitor monocytes and neutrophils at the same time with any inverted fluorescence confocal microscope. Furthermore, our method details how to image the same vessel before (steady state condition) and after inflammation and how to follow the kinetics of leukocyte recruitment. To this purpose, we use the CX3CR1gfp/wt mouse, whose monocytes express eGFP, i.v. injected with an orange dye-labeled murine neutrophils. Using an inverted confocal microscope, it is possible (1) to track and analyze the patrolling Ly6Clow monocytes under steady state conditions and (2) to follow the recruitment of both monocytes and neutrophils in the same vessel after local inflammation. Here we create the inflammatory conditions by using the TLR2/TLR1 agonist Pam3CSK4 12. Moreover, such imaging may help to determine the role of specific molecules of interest in the various steps of the leukocyte recruitment cascade if performed on specific knock-out mice or in presence of blocking antibodies 6,9,13. NOTE: Animal procedures were performed in accordance with the Institutional Ethical Committee of Animal Care in Geneva, Switzerland and the Cantonal Veterinary Office. Authorization number GE/63/14. Sacrifice mouse (8-12 week old) by cervical dislocation. Sterilize hind legs with 70% ethanol. Remove skin from hind legs. Dissect out mouse femurs and tibias and remove tissue from legs with a scalpel. Rinse legs with 90% ethanol and place into a culture dish filled with PBS. Under the culture hood, clean tissue from femurs and tibias with a scalpel and separate at knee joint. Cut off each end of the bones. Flush bone marrow from each bone using a 23G needle and a 1 ml syringe filled with preparation medium (phenol red-free DMEM/F12, 1% rat serum), into a 50 ml screw tube. Disrupt cell aggregates by delicately passaging through the 23G needle and a 1 ml syringe. Bring total volume to 25 ml with preparation medium. Centrifuge 250 x g, 5 min, 4 °C. Discard supernatant. Resuspend pellet in 1 ml Red Blood Cell Lysis RBLC buffer (8.3 g NH4Cl, 1 g NaHCO3, 1 ml EDTA (100 mM), complete to 1 L with distilled water, filter 0.22 µm) in a 15 ml screw tube. Incubate 30 sec on ice. Add 10 ml of preparation medium and centrifuge 250 x g, 5 min, 4 °C. Discard supernatant and resuspend in 2 ml preparation medium. Add 150 µl of Mouse neutrophil enrichment cocktail (cell isolation platform kit such as EasySep). Mix and incubate on ice for 10 min. Add 10 ml of phenol red free DMEM. Invert once and centrifuge 250 x g, 3 min, 4 °C. Discard supernatant. Resuspend pellet in 1.75 ml preparation medium in 5 ml polystyrene round bottom tubes. Add 250 µl Biotin Selection Cocktail. Mix and incubate on ice for 10 min. Vortex the magnetic particles (from the cell isolation platform kit) for 30 sec to resuspend particles. Add 500 µl magnetic particles to cell suspension. Mix and incubate on ice for 10 min. Place the tube into the magnet. Wait 3 min. Invert the magnet onto a new 5 ml polystyrene round bottom tubes to collect the desired unlabeled cells. Do not take the last drop hanging in the tube. Unwanted cells will remain in the tube inside the magnet. Discard this tube into a biohazard waste. Place the new tube into the magnet. Wait 3 min. Invert the magnet onto a new 15 ml screw tube to collect the desired unlabeled cells. Do not take the last drop hanging in the tube. Complete volume to 5 ml with phenol red free DMEM. Add 0.5 µl of an orange dye such as Cell Tracker Orange (working concentration 1 µM, CMRA – chloromethyl-rodol-acetate, stock 10 mM in DMSO). Incubate 2 min at 37 °C. Add 2.5 ml of preparation medium. Centrifuge 250 x g, 5 min, 4 °C. Discard supernatant. Resuspend pellet in 1 ml preparation medium in a 1.5 ml tube. Take an aliquot to count with hematocytometer. Incubate 5 min at 37 °C. Centrifuge 250 x g, 5 min, 4 °C. Discard supernatant. Resuspend pellet in 1 ml PBS. Centrifuge 250 x g, 5 min, 4 °C to wash. Discard supernatant. Resuspend pellet as 10x106 cells per 100 µl PBS. Keep on ice until i.v. injection. NOTE: cells have to be i.v. injected as quickly as possible. 6-12x106 neutrophils/mouse are usually obtained. NOTE: Step 4.1.) and 4.2.) should be performed at the beginning of the experiment to avoid extended waiting time of labeled neutrophils on ice. Weigh the CX3CR1gfp mouse (8-12 week old). Prepare 800 µl of anesthetics (ketamine 60 mg/kg, xylazine 4.5 mg/kg, acepromazone 1.75 mg/kg in PBS). Anesthetize mouse. Injection i.p. with 200 µl / 20 g of mouse. Control anesthesia by toe pinching and by checking the respiratory rate. Inject neutrophils (10x106 cells in 100 µl PBS) intravenously using the lateral tail veins or the retro-orbital sinus, at the convenience of the experimenter. Put the mouse on heating pad and protect the eyes with ocular gel. A glass coverslip (35 mm diameter) is put in a 10 cm tissue culture dish, which has a 30 mm diameter hole. Use oil is to maintain the tissue culture dish in contact with the coverslip. Incise abdominal skin with scissors to expose the peritoneum. Incise peritoneum with scissors to expose intestine. Add 200 µl PBS (pre-heated at 37 °C) into the peritoneal cavity. Take the mouse in your hand and turn it face down, so that the intestine gets out of the peritoneal cavity with a gentle pressure. Place the mouse in the tissue culture dish. Gently deroll the intestine with sterilized cotton buds onto the coverslip in order to expose the mesenteric vessels. Cut paper tissues in bands and wet them with 37°C heated PBS. Immobilize the intestine with the pieces of paper tissues to decrease the movements resulting from peristalsis. Put the tissue culture dish and the mouse inside the 37 °C thermostated chamber onto the custom-made tray stage of the inverted microscope. Introduce a syringe containing anesthetics s.c. into the hind leg. NOTE: Additionally, the mouse can receive oxygen (0.5 L/min) with a mask. Control mouse for anesthesia by toe pinching and checking the respiratory rate every 30 min. If needed, deliver a boost of anesthetics (20 µl) to properly maintain anesthesia. NOTE: Drying of the vasculature should be avoided. Therefore, its humidity is maintained by regularly wetting the paper tissues used to immobilize the intestine with 37°C-warmed PBS. Set lasers to 488- and 561- at the lowest power necessary to avoid laser-induced phototoxicity. In our experiments, it is lower than 0.5%. Intensity of GFP in monocytes and orange dye in neutrophils is so bright that usually 0.3% is enough. NOTE: This represents a laser power of 0.15 to 0.25 mW with our system. Acquire images of 512 x 512 pixels (i.e., 635 µm) in 2.2 sec with an open pinhole using the 20X dry objective of the inverted microscope. Use a z-depth between 10 to 20 μm, that ensures sufficient signal with the low laser powers. NOTE: We usually perform experiments with a z-depth between 12 to 16 μm. In the case of presented figures and movies, the z-depth is 20 μm. Phase contrast allows the identification of endothelial walls and imaging is performed on mesenteric veins. Since patrolling cells move quite slowly with a speed of 5-10 µm /min 6, recording a field of interest every 20 sec is satisfactory. With the described settings, the motorized stage allows the recording of up to 7 fields of interest at the same time. Place the mouse and the mesenteric vessels in the thermostat chamber of the microscope are allow them to recover from the preparation for 30 min before the acquisition of the first movie. During this time, choose several fields of interest. Focus on the luminal surface of the vessel closest to the objective. 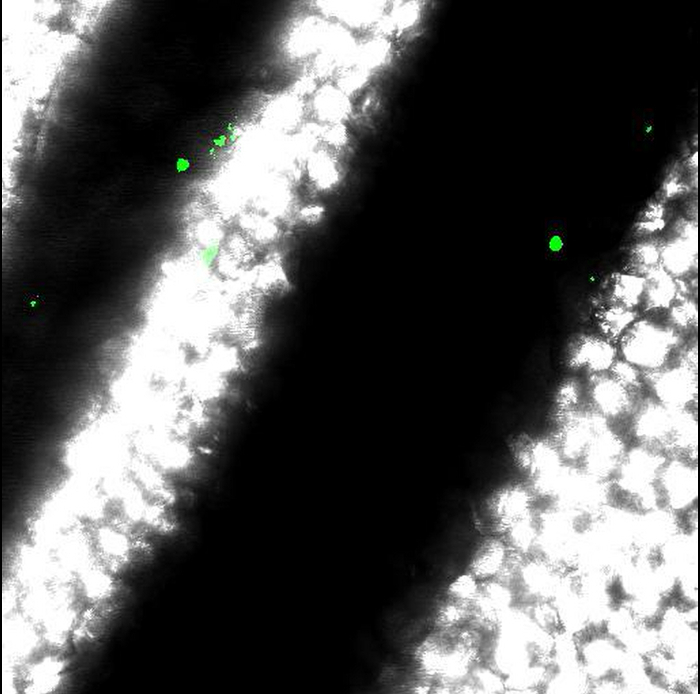 If needed, take advantage of the slight auto-fluorescence of endothelium to set the focus. NOTE: Surgery during mouse preparation slightly stresses the endothelium. Consequently, rolling of neutrophils and/or monocytes can be observed in the first 15 min following mouse preparation. Record a first movie for 30 min under steady state conditions, one image every 20 sec. NOTE: The software acquires each field of interest in 2.2 sec and the motorized stage automatically moves from one field to the other. It goes back to the first position within 20 sec during the 30 min of the recording movie. To initiate blood vessel inflammation, add a drop of 20 µl of PBS containing 100 µg of TLR2/TLR1 agonist Pam3CSK4 12 directly onto the imaged vessels. Control the focus for each field of interest. NOTE: During the course of acquisition, there is always slight changes of focus on z-axis. Despite the 10-20 μm z-depth, this can result in a decrease of fluorescence intensity. Therefore, manually refocus each field of interest at the end of each movie, if needed. Record movies for 30 min-periods and up to 3 hr total after initiation of inflammation. 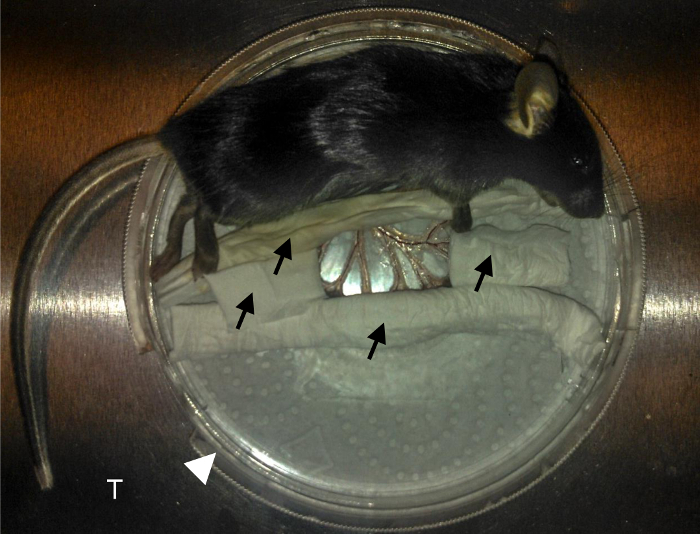 At the end of the experiment, sacrifice anesthetized mouse by cervical dislocation. NOTE: The Nikon acquisition software generates .nd2 files but the following procedure would be similar with other software and brands. Export files as tiff series. Go to ImageJ software (http://rsb.info.nih.gov/ij/). Import the tiff series. Each channel as a different file. Apply a median filter with a radius of 2.0 pixel for the green and red channels to reduce background noise (Process > Filters > Median…). Convert files into binary (Process > Binary > Make Binary). Enable the software to calculate the threshold for each image. Merge channels into one image series (Image > Color > Merge Channels…). Select the monocytes in the green channel, the neutrophils in the red channel and the transmitted light in the grey channel. Convert stacked images into RGB colors (Image > Color > Stack to RGB). Data are imported and compiled in Imaris software (Bitplane). Movements of monocytes and neutrophils are then tracked using the Spot Tracking Wizard. The manuscript describes an optimized protocol to easily monitor the behavior of monocytes and neutrophils in the mesenteric veins of anaesthetized mice in real time. The use of a 37 °C-thermostated chamber is mandatory to maintain the temperature of the mouse and also due to the temperature dependent movement of leukocytes. Preparation of the mouse is displayed in Figure 1. Figure 2 shows all the area seen under the microscope. 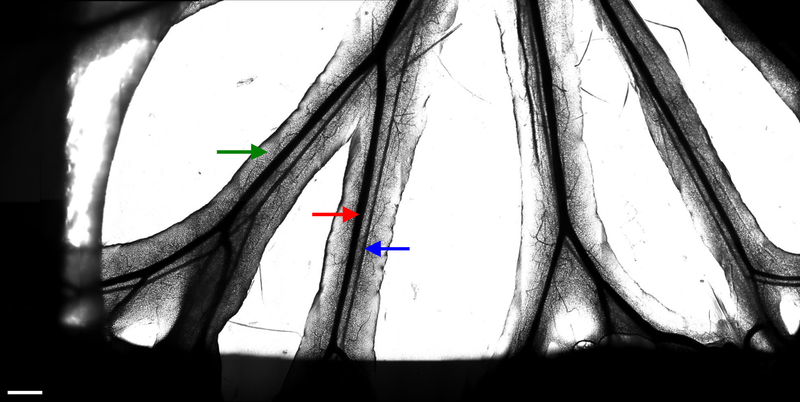 Transmitted light allows the identification of mesenteric veins (red arrow) and arteries (blue arrow). Treatment of acquired images with ImageJ software generated movie files, such as Movie 1 and Movie 2. Figure 3 displays the different steps of image processing for the first time point of Movie 1. Movie 1 shows the patrolling of Ly6Clow monocytes under steady state conditions, as previously described 6,8,14 whereas all neutrophils are circulating in the bloodstream. No neutrophil is patrolling the endothelial wall. Movie 2 shows the same field of interest 90 min after the addition of the TLR2/TLR1 agonist Pam3CSK4 to locally initiate inflammation. In this case, neutrophils and monocytes are massively recruited to the endothelial wall, which they scan meticulously. It is important to note that addition of a TLR agonist induces changes in endothelium width and consequently alters the focus of the z-axis. Therefore, focus should be carefully controlled after the addition of the agonist. Compilation of data in Imaris software (Bitplane) allows the tracking of individual leukocytes using the Spot Tracking Wizard. 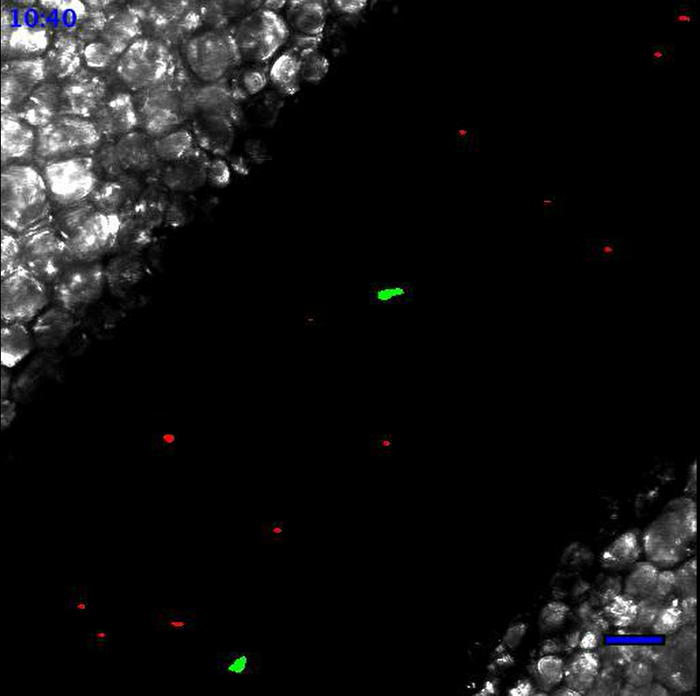 Figure 4 shows the exact track paths of monocytes (green) and neutrophils (red) patrolling along the endothelium. The data are obtained from the analysis of Movie 2, i.e., 90 min after the initiation of inflammation. Tracking of leukocyte paths can be exported as tiff files or xls files to get various statistics such as track length, displacement, duration or speed. This technique offers a nice way to monitor the behavior of monocytes and neutrophils at the same time before and after inflammation. It is possible to track the recruitment of these cells on the endothelial wall overtime. Loss of focus on the z-axis or even x/y displacement can occur as a consequence of intestinal movements that ruin the experiment. Movie 3 illustrates such failed preparation and acquisition. Black arrows indicate PBS-wetted tissue used to immobilize the intestine. White arrowhead indicates the 10cm tissue culture dish. T indicates the aluminum custom-made tray stage that fits into the microscope. Mesenteric blood vessels are nicely exposed at the center on the coverslip. Please click here to view a larger version of this figure. Figure 2. Branches of the mesenteric veins and arteries. Images (20 x 10) taken with a 10X objective were stitched to constitute one large image of the available area. Several fields of interest are then chosen to monitor leukocyte movement with a 20X objective. The red arrow indicates a mesenteric vein. The blue arrow indicates a mesenteric artery. The green arrow indicates the fat tissue surrounding the vessels. The dark area on the sides of the image results from the presence of wetted tissue used to immobilize the intestine. White scale bar represents 1 mm. Please click here to view a larger version of this figure. Figure 3. Image processing with ImageJ. The different steps of image processing are illustrated for the first image of Movie 1. 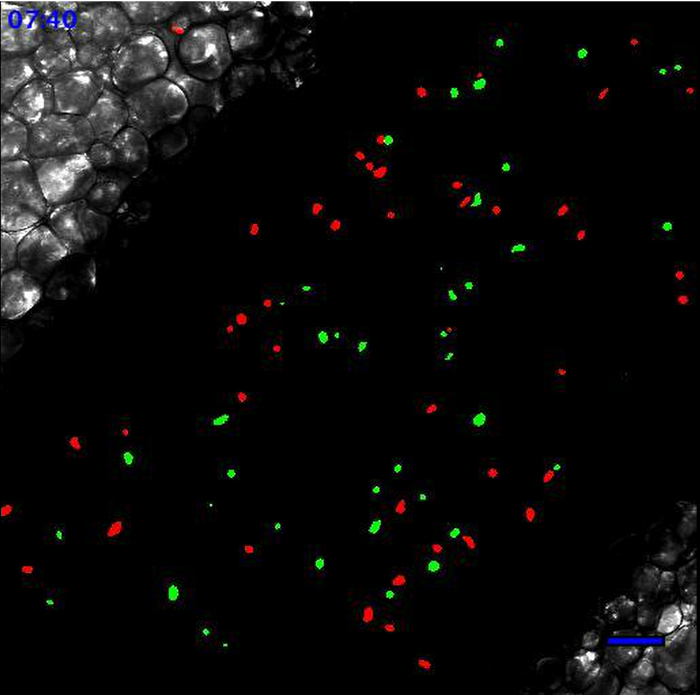 Green (monocytes) and red (neutrophils) channels are processed separately. To the original raw data (A), a median filter is applied (B) and then converted to a binary image (C). (D) Channels are merged into a final image. Green or red lines observed in raw data are cells that are moving so fast that the microscope is not able to wholly acquire them. White scale bar represents 40 µm. Please click here to view a larger version of this figure. Figure 4. Individual leukocyte tracks. Tracks of monocytes (A) and neutrophils (B) patrolling the endothelium are processed with Imaris Software (Bitplane). White scale bar represents 40 µm. Please click here to view a larger version of this figure. Movie 1. Leukocytes scanning the endothelial wall at the steady state. At the steady state, Ly6Clow monocytes patrol the endothelium. Neutrophils are circulating according to the blood flow. Neutrophils are in red and monocytes are in green. Scale bar represents 50 µm. Generated with the 20X objective. Please click here to view this video. 2: Leukocytes scanning the endothelial wall after TLR2-mediated inflammation. Same field of interest as in Movie 1. Movie starts 90 min after the addition of 20 µl of PBS containing 100 µg of Pam3CSK4 (TLR2/TLR1 agonist) directly onto the vessel. Recruited monocytes and neutrophils are meticulously scanning the endothelial wall. Neutrophils are in red and monocytes are in green. Scale bar represents 50 µm. Please click here to view this video. Movie 3: Results obtained from incorrect mouse preparation. Movements of vessels obtained when anesthesia or immobilization of intestine are incorrect. Scale bar represents 50 µm. Please click here to view this video. The methodologies described in this manuscript provide a consistent approach to efficiently study monocyte and neutrophil behavior in mesenteric veins under steady state and inflammatory conditions. The crucial step of the preparation is the immobilization of the intestine with PBS-wetted tissues. If performed properly, mesenteric vessels are nicely exposed on the coverslip for image acquisition. This enables the selection of several fields of interest to monitor leukocyte behavior in mesenteric veins. Our protocol involves the exteriorization of mesenteric vessels before the start of the experiments, enabling (1) to directly induce inflammation on the monitored vessels, and (2) to record the early time points after stimulation and (3) to follow up the kinetics of recruitment of leukocytes and their behavior in the same vessel before and after induction of inflammation. We transfer neutrophils purified from murine bone marrow of the same genetic background and not from blood as more cells can be obtained per animal (6-12x106 vs 0.5-2x106 /mouse). If use of blood neutrophils is preferred, the same protocol can be carried out for cell purification. In intravital imaging, the visualization of the vasculature is enabled by the transmitted light in the case of mesenteric vessels. Alternatively, fluorescent antibodies against PECAM1 (clone 390) or fluorescent high molecular weight dextran (70kDa or 2 MDa) 6,14 can be i.v. injected to detect the vasculature. For instance, intra-scrotal injection of 3 μg anti-PECAM1 (clone 390) was reported to enable vasculature detection with low background and not to affect leukocyte activity in the cremaster model 9. 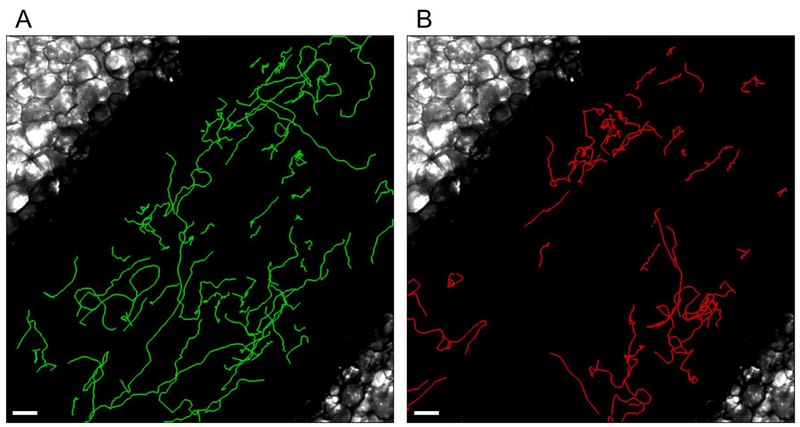 Compared to transmitted light, the use of fluorescent antibodies or dyes notably introduces the possibility of 3D reconstruction of the vasculature, but a channel is sacrificed to its labeling and the acquisition time is increased. Transmitted light is sufficient in the mesenter model thanks to the transparency of the vasculature, as described here. On the contrary, fluorescent labelling of the vasculature is mandatory in the ear dermis or opaque organs. Detection of populations of leukocytes can be achieved using transgenic animals which exhibit endogenous fluorescence in specific cell types (monocytes Cx3cr1eGFP/wt6 or cd115CFP15 or cd68gfp16 ; monocytes and neutrophils LyseGFP9 ; and platelets cd41YFP17). Although CX3CR1 is expressed in all monocytes and some subsets of NK and T cells, the Cx3cr1eGFP/wt mouse is interesting to distinguish between inflammatory Ly6Chigh monocytes which exhibit less GFP fluorescence than resident Ly6Clow monocytes 6. As CD115 is specific of the monocytic line, the MacBlue mouse cd115CFP is an interesting model. However it is not possible to distinguish Ly6Chigh and Ly6Clow monocytes. An alternative to transgenic fluorescent mice is the i.v. injection of fluorescent antibodies to label the populations of leukocytes in real time. For instance, monocytes can be labeled with anti-CD115 (clone AFS98), neutrophils with anti-Ly6G (clone 1A8) and platelets with anti-CD49b (clone HMα2). In general, all these antibodies are depleting at high dose. Therefore, they should be used with caution for short period of times and at low levels. It should be noted that even at low dose, an impact on cell function cannot be ruled out. Personal experience with low amounts (1-2 μg) enables the labelling of CD115+ monocytes and Ly6G+ neutrophils without depletion (data not published). Although the model of the ear dermis vasculature is non-invasive as the ear is untouched, the depth of the ear dermis is a concern, which makes it a model more suitable for 2-photon microscopy 13. Moreover, it is not possible to directly stimulate the vessel in the ear model without disturbing physically the preparation. Our protocol can be applied with any inverted confocal microscope. Since scanning speed and laser power are machine-dependent, acquisition of one frame (512 x 512 pixels, i.e., 635 µm) at a single z-plane requires approximately 2.2 sec with our settings for the galvano scanner of the Nikon A1R. Unfortunately, this low speed limits the possibility of recording four-dimensional movies of mesenteric veins without a loss of quality. The resonant scanner of the A1R offers a high acquisition speed, although the quality of images is strongly reduced (background versus specific signal) for our experiments with the CX3CR1gfp/wt mouse. It should be kept in mind that lasers are set at lower than 0.5% (< 0.25 mW) to avoid phototoxicity and bleaching. Woodfin et al managed to acquire movies in 4D (60 z-stack images in 40 sec) of cremaster venules using a Leica TCS-SP5 9. As the authors image values of 20–40 µm in diameter, they are probably less sensitive to changes in focus than in our model (monitoring of mesenteric veins of 200-400 µm). When imaging live tissue, control of focus is the most important concern, which restricts the possibility to record a unique movie lasting several hours. We consider that recording movies lasting 30 min (or 45 min) is the most practical in the mesenteric model. The addition of TLR agonists alters the vessel width and therefore the focus. Consequently, it is very difficult to image properly the first 10-15 min after stimulation until the vessels stabilize. Another limitation is the duration of the experiment. Because of the difficulty to maintain the mouse anesthetized properly over a long period of time, it is difficult to image more than 4 hr after inflammation. The use of other anesthetics, such as continuous isoflurane inhalation, might be an option (although not tested by us). In old mice (over 16 weeks of age), increased amount of fat deposits around the vessels decrease the quality of visualization of mesenteric vessels. Therefore, it is better to run experiments with 8-12 week-old mice. This technique can be combined with the i.v. injection of antibodies to block molecules of interest or deplete given leukocyte populations, so that the importance of molecules implicated in leukocyte recruitment or behavior can be determined. Additionally, other leukocyte subsets can be tracked using other transgenic mouse strains expressing fluorescent proteins in cell populations of interest. This work was supported by EMBO (to Y.E. ), Foundation Machaon (to Y.E.) and SNSF (to B.A.I.). We thank the Bioimaging Core Facility for the availability of the Nikon A1r microscope and technical assistance. We thank Mrs. Clarissa Bartley for English correction. Ley, K., Laudanna, C., Cybulsky, M. I., Nourshargh, S. Getting to the site of inflammation: the leukocyte adhesion cascade updated. Nat Rev Immunol. 7, 678-689 (2007). Nourshargh, S., Hordijk, P. L., Sixt, M. Breaching multiple barriers: leukocyte motility through venular walls and the interstitium. Nat Rev Mol Cell Biol. 11, 366-378 (2010). Nourshargh, S., Alon, R. Leukocyte migration into inflamed tissues. Immunity. 41, 694-707 (2014). Ley, K., et al. Chapter 11. Intravital microscopic investigation of leukocyte interactions with the blood vessel wall. Methods Enzymol. 445, 255-279 (2008). Sperandio, M., Pickard, J., Unnikrishnan, S., Acton, S. T., Ley, K. Analysis of leukocyte rolling in vivo and in vitro. Methods Enzymol. 416, 346-371 (2006). Auffray, C., et al. Monitoring of blood vessels and tissues by a population of monocytes with patrolling behavior. Science. 317, 666-670 (2007). Cros, J., et al. Human CD14dim monocytes patrol and sense nucleic acids and viruses via TLR7 and TLR8 receptors. Immunity. 33, 375-386 (2010). Hanna, R. N., et al. The transcription factor NR4A1 (Nur77) controls bone marrow differentiation and the survival of Ly6C- monocytes. Nat Immunol. 12, 778-785 (2011). Woodfin, A., et al. The junctional adhesion molecule JAM-C regulates polarized transendothelial migration of neutrophils in vivo. Nat Immunol. 12, 761-769 (2011). Proebstl, D., et al. Pericytes support neutrophil subendothelial cell crawling and breaching of venular walls in vivo. J Exp Med. 209, 1219-1234 (2012). Wantha, S., et al. Neutrophil-derived cathelicidin promotes adhesion of classical monocytes. Circ Res. 112, 792-801 (2013). Ozinsky, A., et al. The repertoire for pattern recognition of pathogens by the innate immune system is defined by cooperation between toll-like receptors. Proc Natl Acad Sci U.S.A. 97, 13766-13771 (2000). Lammermann, T., et al. Neutrophil swarms require LTB4 and integrins at sites of cell death in vivo. Nature. 498, 371-375 (2013). Carlin, L. M., et al. Nr4a1-dependent Ly6C(low) monocytes monitor endothelial cells and orchestrate their disposal. Cell. 153, 362-375 (2013). Hamon, P., Rodero, M. P., Combadiere, C., Boissonnas, A. Tracking mouse bone marrow monocytes in vivo. J Vis Exp. (2015). Iqbal, A. J., et al. Human CD68 promoter GFP transgenic mice allow analysis of monocyte to macrophage differentiation in vivo. Blood. 124, e33-e44 (2014). Jenne, C. N., Wong, C. H., Petri, B., Kubes, P. The use of spinning-disk confocal microscopy for the intravital analysis of platelet dynamics in response to systemic and local inflammation. PloS One. 6, e25109 (2011).